I wanted to hold an annual event that was in context with the house and its history, and which I could get fully behind. I think it’s impossible for any owner of somewhere like Althorp to support an event that doesn’t excite them. I love literary festivals, and have spoken at a lot of them as an author. 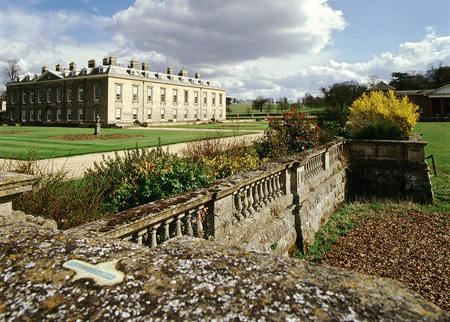 At Althorp, I wanted to establish one that was relaxed, enjoyable for everyone involved, unpretentious, and informative. My father and I read this together, at my bedtime, when I was very small. He had a fantastic reading voice, and brought every page to life. This unashamed celebration and explanation of our past was one of my childhood companions. It’s a historical Bible, but the illustrations, and the well-chosen myths, made me forget that it was in any way educational. The first book I got out from the library at my prep school, and read to the end. History has always been my passion, and this book helped to ignite the flame. I was lucky enough to be taught English at Eton by Chris Dixon, a ‘beak’ who constantly challenged us with difficult works. Among these were Bobrowski’s bleaker output, coloured by his Second World War experiences—including witnessing a massacre of Jews. It was on this that I wrote my best schoolboy essay. It’s in Eton’s archives, somewhere. It made me believe I could write. I read this before the peerless TV adaptation appeared, and reread it regularly. Waugh’s brilliant, if cruel, observations and his crisp prose still surprise and thrill me. The only book that has made me weep. It deals with early attempts to establish Christianity in Japan, and the brutal treatment meted out to the missionaries. Its real theme is the struggle Endo—Japan’s Graham Greene—had with his Catholic faith. Levi wrote this beautiful, agonising account of his experiences in Auschwitz as one of the great personal testimonies to the horrors of the Holocaust. It’s easy to contain self-pity, when you read what Levi endured. Churchill does lapse into ancestor worship at times, but this extraordinarily wide-ranging, four-volume set is an exquisitely written study of a complex, but key, part of our history. These are the musings of a glamorous young Frenchman, left speechless and paralysed by a massive stroke. He learned to dictate, letter by letter, through twitching his one working eyelid. I read this heartbreaking book in one sitting. Its account of the strength of the human spirit will be with me forever. This was the first book I read by Mr Bryson—the only contemporary author who makes me laugh out loud. For me, nobody else blends huge intelligence, vast knowledge and wry observation to such comic effect. A music critic friend introduced me to Nabokov’s wonderful memoir; I’ve never fallen so instantly in love with a book. It’s lyrical, glamorous, moving and—I think—the most enchanting work of autobiography that I’ve ever read. I’m fascinated by the way in which Nancy Mitford splits herself between the canny, detached narrator and impulsive, giddy Linda. This novel is so painfully self-aware and honest, when you look beneath the shimmer and sparkle on the surface. Waugh patronised Mitford; I think she was sometimes the better writer. Of all ghost stories in country houses, none touch the quiet horror and psychological depths of this novella. I know it so well now that I could walk through Bly blindfold (to pick up on James’s suggestive house name). But the mystery never lessens its hold. My late father had a horror of Proust (I don’t think he ever read him) that made his work a forbidden treat. Now I read it whenever I get the chance; I can pick the novel up at—almost—any page and slide back into a world of raw desires and disappointed hopes, where private agony isn’t always discreet. I first read this magnificent novel when I was 14, and fell under its spell. Like Nabokov, Lampedusa conjures up a lost world with an airy grace that makes the writing look utterly effortless. His characters are noble only by birth; their fallibility is what gives them life, and an enduring fascination. This is the first of what I call the new wave of post-Georgette Heyer historical novels. Character-led rather than driven by battles and kings, it convincingly bridges the gap between Restoration England and our contemporary life. With this trilogy, Mr Pullman sent out a clarion call to us writers: it’s possible to write a cracking adventure story, with a memorable girl heroine, and be unabashedly serious and moral about it too, getting your readers to ponder the nature of good and evil. This first collection by one of America’s best short-story writers blew me away. The stories are funny and wise and bittersweet, a winning combination I envy. This book is a love story tempered by community and social constraint. Although it ends reasonably happily, it feels very real, too. Love doesn’t solve everything, a lesson I try to apply to my own novels. Possibly the best title ever for a novel. I read it when I was 17, and its small-town southern Gothic angst stayed with me a long time.